After decades of secrecy, Air Force officials acknowledged Nov. 13 that Communist-built fighters were flown at the Tonopah Test Range northwest of Las Vegas, Nev.
From 1977 through 1988, the program, known as Constant Peg, saw Air Force, Navy and Marine aircrews flying against Soviet-designed MiG fighters as part of a training program where American pilots could better learn how to defeat or evade the Communist bloc's fighters of the day. Brig. Gen. Hawk Carlisle, the 3rd Wing commander at Elmendorf Air Force Base, Alaska, is a former member of the 4477th Test and Evaluation Squadron and remembers the valuable training the unit provided. "CONSTANT PEG afforded pilots an opportunity to learn how to fight enemy aircraft in a controlled, safe environment without having to endure the risks of actual air combat," said General Carlisle. "Typically a pilot would start with a basic familiarization flight to observe the enemy airplane and study its characteristics, practicing one-on-one defensive and offensive maneuvers against it, and finally, experience multi-bogey engagements high over the desert scrubland of the Nellis Air Force Base ranges." As a result of marginal performance of American fighter forces in the skies over North Vietnam, Constant Peg complemented other revolutionary training programs such as Red Flag and Top Gun, and the Air Force and Navy-Marine aggressor squadrons. The program also was intended to eliminate the "buck fever" or nervous excitement many pilots experience on their first few combat missions. Historical experience indicated that pilots who survived their first ten missions were much more likely to survive a complete combat tour, and Constant Peg was intended to teach them the right "moves" to enable them to come out on top of any engagement. The end of the Constant Peg nearly coincided with the end of the Cold War, by which time some of its graduates already had proven themselves in actual air combat. 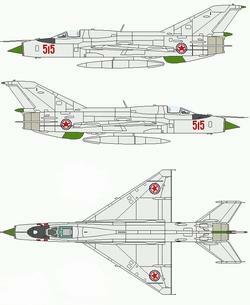 Threat aircraft flown by the Red Eagles spanned several decades and technical generations of capability. There was the MiG-17 Fresco, a small, agile single-seat transonic fighter placed in service just after the Korean War and used extensively over Vietnam and the Middle East; the MiG-21 Fishbed (shown right), a high supersonic fighter used world-wide in large numbers, and the swing-wing MiG-23 Flogger, likewise in global service, an attempt by the Soviets to match the sophisticated capabilities of the F-4 Phantom. "Although it came too late to influence Vietnam, Constant Peg training greatly influenced the success of American Airmen in Desert Storm, who shot down 40 Iraqi fighters, many of which were Fishbeds and Floggers," said General Carlisle.